Welcome back to the blogathon everyone! Hope you all enjoyed your weekend (or are continuing to enjoy it this Memorial Day). I have for you today a review from Renlau who runs his own site Kaput, Already — a place that’s dedicated to more than just well-written film reviews. 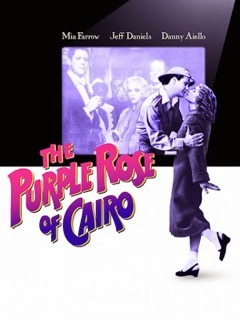 This site has many an interesting post to keep you going so I urge you to give it a look after checking out what he has to say about Woody Allen’s 1985 romantic comedy, The Purple Rose of Cairo. The Purple Rose of Cairo is Woody Allen’s romantic comedy from 1985 about a bored movie character who falls in love with his biggest fan.